Each year the U.S. Department of Transportation Maritime Administration releases grant funds under its Small Shipyard Grant program. While mainly intended for facilities that work on commercial or government vessels, the grants have worked for the benefit of recreational boating as well. Two recipients of this year’s grant awards cross lines between commercial and recreational facility. The purpose of the U.S. Department of Transportation Maritime Administration Shipyard Grant is to foster efficiency, competitive operations and quality ship construction, repair and reconfiguration. The grants are also available for training projects for employees or future employees related to shipbuilding, ship repair and associated industries. This year, $19,600,000 was distributed for capital and related improvements. Each grant is about a million dollars, so the number of grants awarded depends on the amount of funding Congress approves. In any given year, the administration receives more than ten times the applicants than what is available for funding. To be eligible, the facility applying for the grant must construct, repair or reconfigure vessels 100 feet in length or greater for non-commercial vessels, and/or construct, repair or reconfigure vessels 40 feet in length or greater for commercial or government use. The facility may not have more than 1,200 production employees and must be located in just one geographic location. 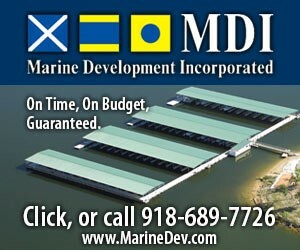 Jarrett Bay Boatworks of North Carolina was awarded $1,000,000 to support the purchase of a 300-ton marine travelift. Jarrett Bay Boatworks is the anchor for a marine industrial park, which encompasses 20 marine businesses. 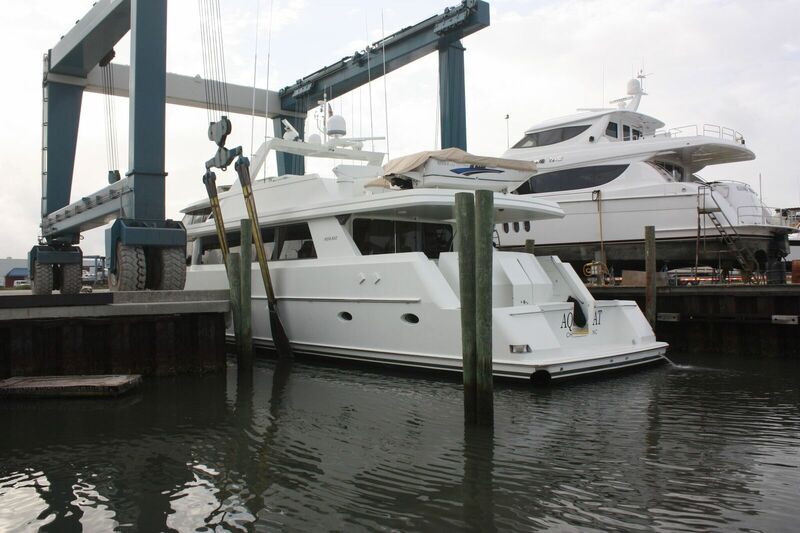 The facility is a marina, boatyard and builder of custom sportfishing vessels from 26 feet up to 90 feet. It also works on a range of commercial and government vessels up to 136 feet. Any additional hauling that Jarrett Bay can conduct will mean more business for everyone on-site. “No doubt that most of the other businesses will benefit from this lift from additional core business to just leasing storage space. Every business here, unless they just build new boats, has a build, repair or complimentary service like electric, power, granite shop, even interior design, that will all benefit from hauling larger boats,” Stack said. Front Street Shipyard of Maine was another commercial and recreational crossover that this year was awarded a $667,028 small shipyard grant. The funds will be used toward the purchase of a Flow Mach 700 Waterjet Cutting Machine, which will be used for large yacht refits and commercial vessel construction projects, particularly for fiber carbon ferry construction. Workers overhaul a recreational vessel at Front Street Shipyard. The shipyard predominantly works on recreational craft. Front Street Shipyard is a yacht yard, marina and storage facility that caters to the needs of every type of vessel ranging from small recreational boats to commercial vessels and superyachts up to 200 feet. JB Turner, president of the shipyard, said the overall operation is about 5 percent commercial and the remainder recreational. “We store and work on the fast passenger ferry out of Bar Harbor, haul lots of fishing boats and tug boats, and we have a barge sitting in our yard right now. On the recreational side, we haul anything from 180 feet down. Mostly, they come from around New England, but we have some Caribbean and European boats. The boats are traveling up and down the coast, and we arrange for fall and spring work on them,” Turner said. The marina at the shipyard has 46 slips with mostly local customers filling those slots. Turner explained that their operations are split between refit and regular storage maintenance and marina customers. One side of the yard caters to boats 70 feet and under, hauling and storing them and performing annual maintenance type work. 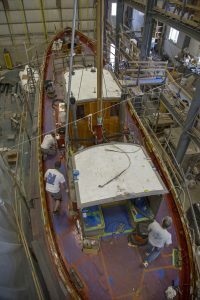 The other side does refit work, which is more major overhauls and provides more year-round work. The yard also has two travelifts, one for each side, as well as separate employee teams. Jarrett Bay had applied for this grant several years ago but was not successful at the time. The boatyard was not considering it this year, but nearby Carteret Community College brought it to Jarrett Bay’s attention and worked with the company on the application. However, the bulk of the grant writing was done in-house. Stack said that applying for the grant for Jarrett Bay took effort but was not overwhelming. “It was challenging from the perspective that we’ve never quite done it this way. We went into it eyes wide open with the thought that we’re going to put in as much information as we can that’s relevant. We didn’t engage a consultant and just followed the criteria, hitting all the appropriate points. We made sure they knew the area, knew the business itself and knew what the lift would do to expand our business and the whole area. No one in North Carolina had ever received this grant. No one has a 300-ton lift. Our story was compelling,” Stack said. Front Street Shipyard has a similar story in that it applied last year and was not successful but tried again. It did all the writing in house. Turner said the shipyard also set up to get support from local and state politicians and were successful on that front with both Maine Senators Susan Collins and Angus King, along with local elected officials, writing letters to the review board. “The city of Belfast has been supportive of grants and the shipyard since our inception in 2011. The city has gone out of the way at all times to make anything we need work. The senators have all visited, as has the governor. We also get lots of local support. We have a public walkway right through the yard going over travelift pads, so they see firsthand what we do and they like to watch,” Turner said. Often potential grant applicants shy away from applying because they fear government paperwork and reporting. Stack said he didn’t feel that anything unreasonable was asked. “If you fill out taxes or whatever it’s reporting, and this is just another set of papers and reporting to add to the list,” he said. The reporting continues during the purchase of the equipment, delivery and set-up to ensure the funds are spent as the grantee said they would be. Past that there is nothing further required. Turner agreed that the reporting seemed simple enough especially because Front Street just buying equipment and not looking at a construction project. Both facilities would consider applying for the shipyard grant again in the future, though both also emphasize that this isn’t free money since it does require at least a 25 percent match and a larger match makes the application more competitive. But with businesses that have ongoing needs to meet the demands of the recovering and growing boating industry, every source of outside funding assistance is a benefit.